Digging deeper, though, another interesting behavior emerges as well: While Android’s installed base has grown immensely over the past three years, the percentage of online purchases made on Android phones vs. iPhones has actually slipped noticeably. Horace asks the right question: Why is this? I believe this could be a simple matter of who is buying Android phones and for what reasons. At first, Android purchasers were a lot like iPhone purchasers in that they were seeking out the device itself. They wanted the specific computer-like behavior and many of them wanted the greater customizability that they saw in Android over iPhone. Now, I believe, many more Android buyers are simply getting an Android as their new phone as their carrier contract renews, replacing their old feature phones as the prices for Android devices get better and the ubiquity of touch-screen devices suggests to even the most casual observer that feature phones are now old tech. It’s entirely possible that these are much more casual users who rarely if ever fully use the capabilities of their devices (and, because of this, have the most-limited data plan) because they want a phone first, and a pocket-computer as a distant second. Most iPhone buyers, though, still are seeking the device first, even as more of them come into the fold later, after waiting for the next cycle of their two-year contracts. Think of it this way: These new iPhone buyers could have gotten a perfectly good Android phone for a much lower cost but chose the higher-priced iPhone for specific reasons. Discounting whatever percentage of those “reasons” are status only, I would imagine that most iPhone buyers are seeking ‘pocket-computer” features and not the core phone functionality (and who could blame them — when was the last iPhone ad that showed phone use?). Simplified: New iPhone users are still actively seeking out the device and its computer-like features while new Android users include a growing percentage of their installed base that are choosing, essentially, a more advanced feature phone. At least that’s my hypothesis. Perhaps it could be tested if there is any information available about the size of data packages (and usage) by platform. 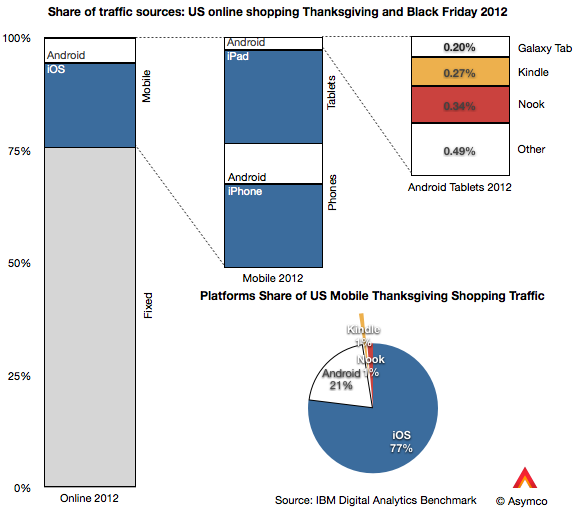 Technology | Why are Android users less engaged than iOS users? Global Tech Review | Why are Android users less engaged than iOS users?